NEW CONSTRUCTION with sweeping OCEAN VIEWS, close to beach access, golf course, medical facilities, shops and restaurants. Four bedrooms, 4 full and one half bath, over 3000 sqft. The home is on an oversized lot, more than 1/2 acre AND in an X flood zone, so no flood insurance is required. Ground level opens into a bonus room that can be used for a game room, flex space, etc, with a full bathroom. It connects to the large garage and additional finished utility/storage room. Walk up the stairs to the second level, which opens up to 15' cathedral ceilings, kitchen, living room, master bedroom and spacious full bathroom, study/office room and a partial bath. There is ample covered deck space on this level, with ocean views. The third level has three bedrooms: one is a master with it's own full bath, the other two bedrooms on this level share a jack-n-jill bathroom. There is also a functional and inviting living/loft space on this top level, designed to showcase the sweeping ocean views. Walk out onto the top-level porch to see the almost 2 miles of ocean view. There is also a large laundry room with space for storage on this level. The front yard is landscaped with sod, irrigation and flower beds. Would you like a pool also? The approved and permitted site plan already has room for a pool and the builder can add that in for an additional cost. Great for a primary residence, 2nd home or investment property. Absolutely gorgeous home, designed for ease of living and to maximize the ocean views. 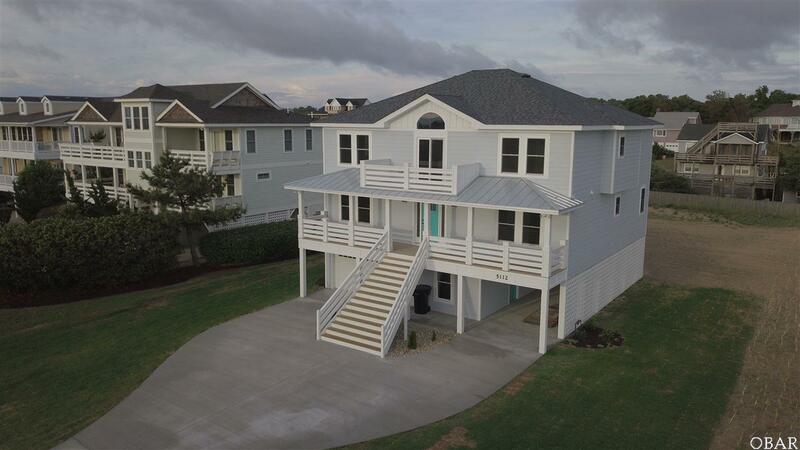 Listing courtesy of Francis Dunn of Keller Williams - Obx.